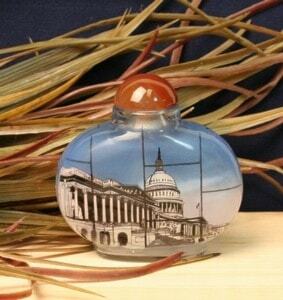 This elegant stained glass perfume bottle featuring the Capitol is not only a collectible for its unique "inside the bottle, painted by hand" artwork, but it's also functional. Each one is custom painted. The 2-ounce bottle comes with a removable lid and stopper. Approximately 2 1/2 x 3 1/2 inches.